We’ve got something cool to show you at Microsoft Ignite. If you’re there, make sure you see “Get an Independent Insider’s View of Desktop Virtualization and Session Remoting” (BRK3280) on Friday morning. I think you’ll find it worth your while, as we’re showing you how we can empirically measure the remote end user experience on Windows Server 2016. Using tools that we created, Benny Tritsch, Ruben Spruijt and I did some benchmark testing of Remote Desktop Services in Windows Server 2016 to learn about the new performance and application compatibility advances in this version of Windows Server. Using the same tools, we can show the results. See for yourself how Windows Server 2016 Remote Desktop Services performs when configured for WARP, RemoteFX and the new Discrete Device Assignment (DDA). And check out the performance of the new Azure N Series VMs configured with DDA. Why Test on Windows Server 2016? We wanted to see how the improvements in RemoteFX and the addition of DDA affected the remote end user experience – after all, this is what makes or breaks an RDS deployment. WARP: The VMs use the hypervisor’s CPU – the GPU is emulated by the hypervisor’s CPU, making apps think there is a GPU. All VMs on the Hypervisor share the host CPU. WARP is the default configuration for RD Session Host server VMs. RemoteFX: The VMs on the hypervisor share the GPU(s). 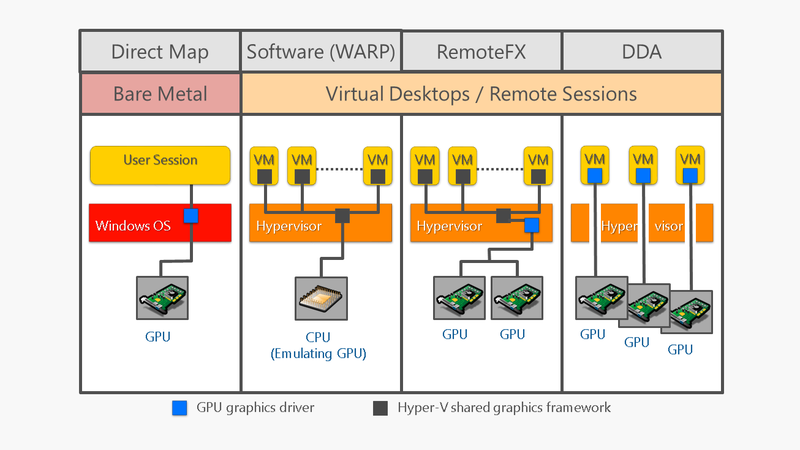 The hypervisor uses the GPU’s IHV graphics driver and maps it to the VMs using the Hyper-V shared graphics framework. DDA (Discrete Device Assignment): Each VM gets a direct map to its own GPU using the IHV (Independent Hardware Vendor) graphics driver. VMs do not share GPUs. For an RD Session Host server, all user sessions would share the GPU assigned to the RD Session Host. Using REX Tracker, we create different deployment scenarios (on-premises, WAN, Cloud and hybrids) and add in common network environment stressors (e.g., latency or packet loss). We then run test sequences that simulate typical user workload using pre-installed applications and application files. Each sequence runs a program that utilizes a specific graphics format such as OpenGL, DirectX or HTML5. Once the test sequences are complete, we grab all the resultant data (screen recordings, telemetry data, network data and response times) and compare it in a series of 4-quadrant displays. These displays demonstrate how the system(s) handle certain graphics formats under certain conditions from the end user perspective. What the end user experience is like for a user running OpenGL applications on an Azure N-series VM configured with DDA. Does an added 50ms of latency change this user experience? What about 150ms of latency? How HTML5, Flash or DX10 applications behave on Windows Server 2016 virtualized guest VMs using RemoteFX. How the end user experience using Azure N-Series VMs and DDA compares to using bare metal.